If you want an easy fall dish, you can try this Crockpot peach cobbler cake mix recipe. It does not require too many ingredients. Most of the ingredients can be found in any season. The cake mix also serves as a shortcut in the cooking process. This dish is a classic one so everyone will fall in love with it instantly. The best thing about it is that you do not need to do heavy work because Crockpot will do it for you. Here is the special peach cobbler recipe that is simple and affordable. A box of your favorite cake mix. Choose the most neutral type of cake such as vanilla and yellow one for this recipe. 4 cups peaches, fresh if they are in season. In the case canned peaches are used, the fruit should be drained out from syrup. A stick of butter, room temperature. Slice the butter into smaller uniformed pieces. Coat the Crockpot’s inside with butter or use cooking spray to avoid food sticking. Combine peaches, light brown sugar, and grounded cinnamon inside a mixing bowl. Pour the mixture into the Crockpot. Put on even layer of cake mix on top of the peaches mixtures. Place sliced butter on cake mix layer until the slices are evenly distributed. Top the raw cobbler with walnuts or other kind of nuts. Place the lid on top of the dish. Turn on the Crockpot on ‘High’ and let the cobbler cooking for three and half hour. To serve the dish, scoop some cobbler on ramekin or plate. Place a scoop of ice cream on top of the cobbler. This Crockpot peach cobbler cake mix recipe can serve about 8 people happily. The usage of Crockpot in this recipe enables the cooker to just leave the ingredients in slow cooker for several hours without extra labor. Because of that this dish is perfect for special dinner such as Thanksgiving because you may need to do various tasks around the house so there will be no time to cook dessert. Adding cake mix allows cooker to cut down some of the ingredients too. Hopefully, readers will recreate this Crockpot peach cobbler cake mix recipe at home. 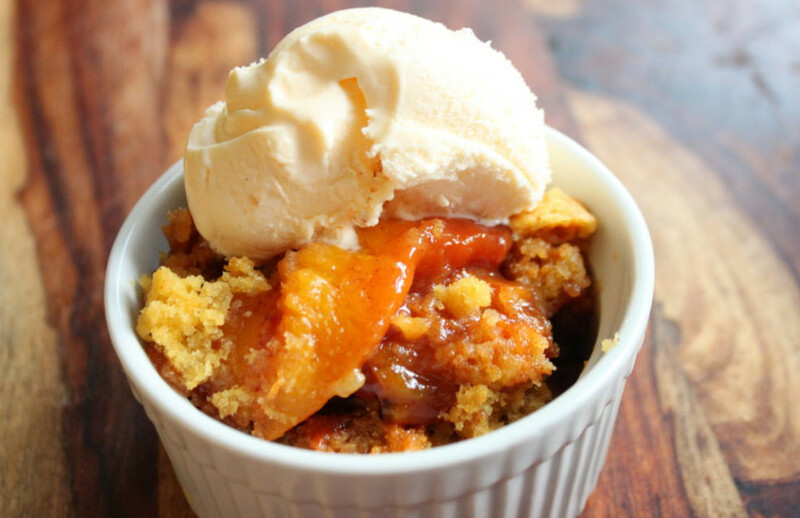 Related Post "Crockpot Peach Cobbler Cake Mix Recipe for Easy Fall-Themed Dinner"